A well-known personality when it comes to NFL, one may wonder how rich is Larry Fitzgerald at the present? As of early 2016, Larry counts his net worth at the amount of $50 million. Needless to say, the major source of his income is his involvement in the sport of football as a wide receiver for the last 12 years, which has added significantly to his riches over the years. Raised in Minneapolis, Larry was educated at the Academy of Holy Angels and later attended the University of Pittsburgh where he played college football, and during his career in college, he was recognized as the best player in the NCAA. During this time, he was rewarded with the 2003 Walter Camp Award, Chic Harley Award as well as Biletnikoff Award. He was considered as one of the best wide receivers when in college football, and was subsequently selected by the Arizona Cardinals in the NFL Draft of 2004. This was the beginning of a very successful career for Larry which still continues until today. During his twelve years long career in the NFL, Larry has managed to set several records. In 2008, he made the record of most touchdown receptions and most receptions in a post-season. Interestingly, he also made a record of most receiving yards in a post-season which counted up to 546. Larry, when he was 26 years set the record being the youngest player to reach 7,000 career receiving yards and is still the youngest player to record 1000 catches in NFL. Of course, being a record-holding successful professional footballer has been playing quite a significant role in Larry’s career as well as his growing net worth. 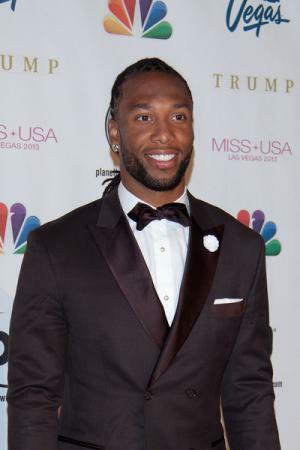 The Dapper Dan Sportsman of the Year in 2003, Larry Fitzgerald is also very prominent as a philanthropist, and founded the “Larry Fitzgerald First Down Fund” which helps children and students in crisis financially. Along with this, he has also established the “Carol Fitzgerald Memorial Fund” in honor of his late mother and the fund works to raise awareness of and assist urban youth regarding breast cancer and HIV/AIDS. In addition to this, he has travelled countries like India, in Africa, Thailand and more to support economic development projects in these countries. 1 With 100 yards receiving in each of the team's four postseason games in '08, Larry Fitzgerald set the NFL record for most consecutive playoff games with 100 yards receiving. He has at least 100 yards receiving in four of the seven postseason games he has appeared in. 2 Larry Fitzgerald is one of just 12 players in NFL history with 12,000+ career receiving yards and 85+ career TD receptions. Fitzgerald will enter the 2015 season as the only active player on the list, which includes six Hall of Fame inductees. 3 In 2005, Larry Fitzgerald and Anquan Boldin became only the second tandem in NFL history to top 100 receptions and 1,400 receiving yards in the same season (Detroit's Herman Moore and Brett Perriman in 1995). 4 In the 2014 regular season finale at San Francisco, Larry Fitzgerald extended his franchise record with a catch in his 163rd consecutive game. That also represents the longest active streak in the NFL.Consecutive Games with a Reception (NFL)Gms / Player (Team) 163 Larry Fitzgerald (Arizona) 137 Wes Welker (Denver) 134 Reggie Wayne (Indianapolis) 133 Andre Johnson (Indianapolis) 128 Brandon Marshall (NY Jets)Fitzgerald has a reception in 169 of 170 career games played. The only game in which he did not catch a pass came on 10/31/04 in Buffalo. 5 With 96 receptions for 1,431 yards in 2008, Larry Fitzgerald joined wide receivers Anquan Boldin (89-1,038) and Steve Breaston (77-1,006) to mark the fifth time in NFL history that a team had three players all reach 1,000 receiving yards in the same season. 6 Larry Fitzgerald caught seven passes for 160 yards against the Eagles in Week 8 of 2014, including a career-long 80-yard TD reception in the third quarter. He now has at least one TD reception in all seven career games against the Eagles, including postseason. 7 Larry Fitzgerald's 103 receptions in 2005 set a franchise single-season mark, breaking Boldin's previous mark of 101 set in 2003. 8 Larry Fitzgerald has nine TD receptions in seven career postseason games, tied with Randy Moss for the NFL record for a player in his first seven postseason games. 9 At 22 years, 123 days old Larry Fitzgerald became the youngest receiver in NFL history to record a 100-catch campaign when he reached the milestone at Indianapolis on 1/1/06. 10 Larry Fitzgerald appeared in his 170th career game in the '14 regular season finale vs. San Francisco. He now holds sole possession of 9th on the franchise all-time games played list. 11 Larry Fitzgerald was the first player in NFL history to record 90+ receptions five times in their first seven seasons. 12 Larry Fitzgerald's 170 games played rank as the ninth-highest total in franchise history. 13 Larry Fitzgerald is one of just 12 players in NFL history with 12,000+ receiving yards and 85+ TD receptions in their career. 14 Larry Fitzgerald was originally selected by the Cardinals in the first round (third overall) of the 2004 NFL Draft and has started 168 of the 170 games in which he has appeared. Only players taken ahead of him were Eli Manning (No. 1 to San Diego) and Robert Gallery (No. 2 to Oakland). 15 An eight-time Pro Bowl selection, Larry Fitzgerald was voted into the annual all-star game for seven straight seasons (2007-13). His eight career Pro Bowl selections are tied with Hall of Fame safety Larry Wilson for the most in franchise history. Earned MVP honors in the 2008 Pro Bowl and his eight career TDs represent a Pro Bowl record. 16 Larry Fitzgerald has caught at least one pass in a franchise-record 163 consecutive games. Fitzgerald enters the 2015 season with the NFL's longest active streak of consecutive games with a reception. 17 Larry Fitzgerald is one of just five players in NFL history to record at least 1,400 receiving yards four times in their career, joining Jerry Rice (6), Randy Moss (4), Marvin Harrison (4) and Andre Johnson (4). 18 Larry Fitzgerald is one of just nine players in NFL history with at least 10 TDs in five different seasons. 19 In Week 15 of the 2014 season at St. Louis, Larry Fitzgerald reached 900 career receptions. At 31 years, 102 days old, he became the youngest player in NFL history to reach 900 career receptions. 20 Larry Fitzgerald's 909 career receptions ranked 19th on the NFL's all-time receptions list while his 12,151 receiving yards rank 21st on the NFL's all-time receiving yardage list. 21 In Week 11 of the '14 season vs. Detroit, Larry Fitzgerald surpassed 12,000 career receiving yards. At 31 years, 77 days old, he became the second-youngest player in NFL history to reach the milestone behind only Randy Moss (30 years, 306 days). 22 Larry Fitzgerald is the franchise career leader in receptions (909), receiving yards (12,151), receiving TDs (89), total TDs (89), 100-yard receiving games (38) and consecutive games with a reception (163). 23 Following the 2014 season, Larry Fitzgerald was named the inaugural winner of the Art Rooney NFL Sportsmanship Award, presented to an NFL player who demonstrates on the field qualities of great sportsmanship, including fair play, respect for opponents and integrity in competition. Fitzgerald was selected in a vote of his fellow NFL players. Fitzgerald was also selected as the Cardinals nominee for the Salute To Service award in '14. In 2012, was named one of three finalists for the "Walter Payton NFL Man of the Year" Award and was also named the recipient of the 4th Annual Arthur S. Arkush Humanitarian Award by Pro Football Weekly, which is given to the NFL player whose contributions to the community and charitable organizations are especially outstanding. 24 Larry Fitzgerald had one of the best postseasons of any player in NFL history during the Cardinals run to Super Bowl XLIII in 2008, shattering the NFL single postseason record for receptions (30), receiving yards (546) and receiving TDs (seven). His 30 receptions surpassed the previous record of 27, shared by Carolina's Steve Smith (2005) and New England's Wes Welker (2007). His 546 receiving yards surpassed Jerry Rice's 1988 total of 409 yards and his seven TD receptions topped Rice's 1988 total of six. 25 Larry Fitzgerald has been named NFC Offensive Player of the Week three times in his career, with all three award-winning performances coming against the Philadelphia Eagles. In Week 10 of the '11 season, he earned the honor for the first time in his career following his performance against the Eagles (7 rec, 146 yards, 2 TDs). In Week 3 of the '12 season, earned NFC Offensive Player of the Week after hauling in nine receptions for 114 yards and a TD against Philadelphia. He again earned the honor for his performance against the Eagles in Week 8 of the '14 season, when he hauled in seven receptions for 160 yards, including a career-long 80-yard TD in the third quarter. 26 Son of Larry Fitzgerald. 27 Cover athlete with Troy Polamalu on Madden NFL 2010 (2009). 28 Attended Holy Angels High School in Minneapolis, Minnesota. 29 Wide receiver with the Arizona Cardinals, 2004-present. 30 Attended the University of Pittsburgh. 31 Selected by the Arizona Cardinals in the 1st Round (3rd pick overall) of the 2004 NFL Draft. If there is one professional athlete that deserves the money its LF. Respect.